Every year, the beauty of autumn captures my attention. The air gets crisp, and the leaves begin to turn, and it seems there is a golden glow in the air. I remember when I was pregnant with my 4th baby, lying in my bed (miserable… waiting for the baby to make his appearance) and I would stare out the window at the tree in our yard. As the days passed it would turn from brilliant green to yellows and golds and reds, until the whole thing looked glowing with fire. It really was brilliant. That tree marked the days as I awaited my baby. When the leaves had finally all fallen, the baby did arrive. Then the next year came and the tree displayed its beautiful show of colors once again. And the year after that…and that..and that…It remained a constant. I love the seasons. I love seeing how God’s character is displayed in the seasons. 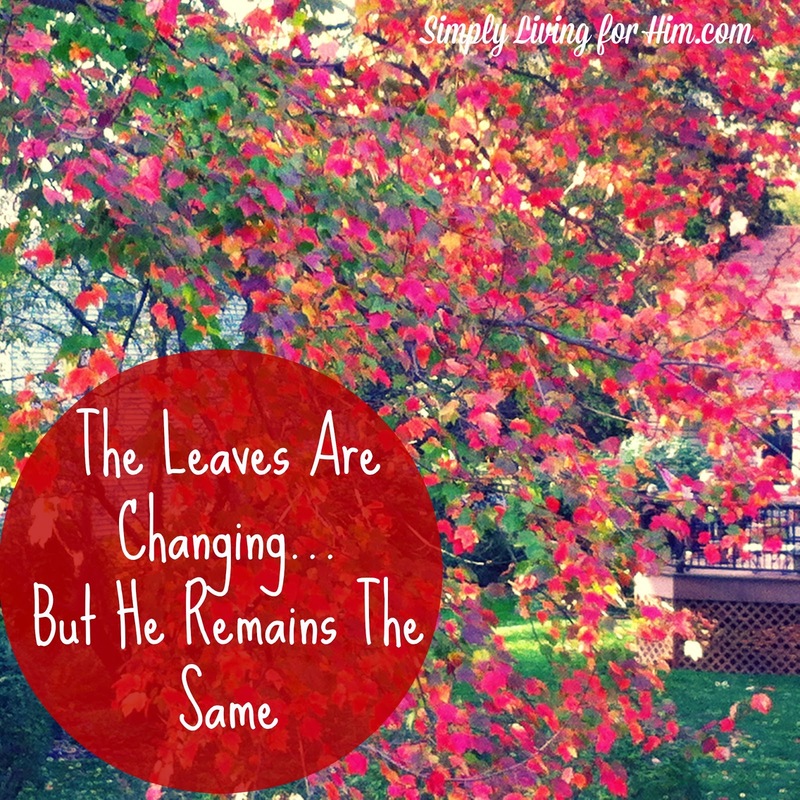 He is so constant, just like the seasons. You can’t stop them and you know that each year they will happen. So even though the seasons change, they always remain predictable and constant. Just like His love for us. It doesn’t matter who we once were, His love remains. He never gives up on us. He never fails. So, as I watch the tree begin to change this year, I notice how quickly time seems to pass. How many times I’ve watched that tree change…and it’s a blink of an eye. A decade is like a vapor. Isn’t that true of life. It is quick, yet He is eternal. He will always be. There are no worries, no seasons to await. He is there. Forever. As I look upon life and see how quickly it passes, I want to grab hold of it and live boldly, never afraid of new things. He is constant and He is there. Holding us each step of the way. Unlike the tree that will die one day…He will remain. Forever. iHomeschool Studio is Coming- and a Ticket Giveaway!